جعفری حاجتی, فرشته, آق آتابای, مریم. (1392). بررسی پدیده برهم‌کنش بین زوج‌‌‌زمین‌لرزه 21 مرداد 1391 اهر – ورزقان و توزیع مکانی پس‌لرزه‌ها. مجله ژئوفیزیک ایران, 7(3), 13-24. فرشته جعفری حاجتی; مریم آق آتابای. "بررسی پدیده برهم‌کنش بین زوج‌‌‌زمین‌لرزه 21 مرداد 1391 اهر – ورزقان و توزیع مکانی پس‌لرزه‌ها". مجله ژئوفیزیک ایران, 7, 3, 1392, 13-24. جعفری حاجتی, فرشته, آق آتابای, مریم. (1392). 'بررسی پدیده برهم‌کنش بین زوج‌‌‌زمین‌لرزه 21 مرداد 1391 اهر – ورزقان و توزیع مکانی پس‌لرزه‌ها', مجله ژئوفیزیک ایران, 7(3), pp. 13-24. جعفری حاجتی, فرشته, آق آتابای, مریم. بررسی پدیده برهم‌کنش بین زوج‌‌‌زمین‌لرزه 21 مرداد 1391 اهر – ورزقان و توزیع مکانی پس‌لرزه‌ها. مجله ژئوفیزیک ایران, 1392; 7(3): 13-24. زوج‌‌‌زمین‌لرزه اهر – ورزقان به‌صورت دو رویداد پی‌درپی در فاصله زمانی نسبتا کوتاهی از هم، در تاریخ 21 مرداد ماه 1391 (11 اوت 2012) شهرستان‌های ورزقان، اهر، هریس و پیرامون آن واقع در استان آذربایجان شرقی را به‌‌شدت لرزاند که موجب خسارت‌های جانی و مالی فراوان شد. این تحقیق به‌منظور بررسی رابطه برهم‌کنش بین زوج‌‌‌زمین‌لرزه و همچنین بین این حوادث و پس‌لرزه‌ها صورت گرفته است. بدین‌‌منظور، تغییرات تنش هم‌لرزه‌ای ناشی از زمین‌لرزه اول آذربایجان و همچنین زوج‌‌‌زمین‌لرزه به‌‌ روش مدل تغییر تنش کولمب مورد محاسبه قرار گرفت. بررسی‌های صورت گرفته نشان می‌دهد که گسیختگی دوم در محدوده افزایش تنش اطراف کانون زمین‌لرزه اول و پس‌لرزه‌ها نیز در نواحی افزایش تنش حاصل از زوج‌‌‌زمین‌لرزه روی داده است. ازاین‌رو نتایج حاصل بیانگر رابطه برهم‌کنش بین زوج‌‌‌زمین‌لرزه اهر- ورزقان و همچنین بین این دو رویداد اصلی و پس‌لرزه‌ها است. علاوه‌براین، با توجه به قرارگیری پس‌لرزه‌ها در نواحی افزایش تنش ناشی از زوج‌‌‌زمین‌لرزه، می‌توان نتیجه گرفت که مدل تغییر تنش کولمب روش خوبی برای ارزیابی مناطق مستعد حوادث لرزه‌ای است. آگاهی از مناطق مستعد خطر، نقش مهمی در جهت کاهش خسارت‌های جانی و مالی پس از وقوع زمین‌لرزه اصلی ایفا می‌کند. During the past decade, studies related to earthquake forecasting and assessment of seismic hazard have been focused on stress transfer and fault interactions. According to the earthquake interaction phenomenon, occurrence of any earthquake alters the stress state (the shear and normal stress) on its neighboring faults which can delay (decrease), or trigger (increase) subsequent events (Stein, 1999). In recent years, one of the models which have been widely used to estimate coseismic stress perturbations has been the static Coulomb stresschanges. These calculations are done based on Okada’s code with assumption of a shear modulus of 3.2 × 105 bars and Poisson’s ratio of 0.25 using the program Coulomb 3.3 (Toda et al. 2005, Lin and Stein, 2004). The aim of this research is to explore the fault interaction through static stress transfer between Ahar-Varzaghan double earthquakes and the possible stress triggering relationships between these main shocks and their aftershocks. These double earthquakes occurred on August 11, 2012, near the cities of Ahar and Varzaghan in the East-Azerbaijan Province in the northwest of Iran. The first event with a magnitude of Mw 6.5 occurred at 16:53 local time, and the second one with Mw 6.3 took place about 10 minutes later. These earthquakes killed more than 306 people and a large number of people were injured. Ahar-Varzaghan double earthquakes followed by many aftershocks the largest of which occurred with a magnitude of MN 5.4. These double earthquakes occurred in places where no active faults have been identified, but there are numerous active faults in their surrounding area such as the North Tabriz Fault, Bozquosh Fault, and Ahar Fault. In order to investigate the fault interactions between Ahar-Varzaghan double earthquakes, Coulomb stressperturbations due to slip on the first source fault were calculated on a specified oriented receiver fault parallel to the second main shock. Receiver faults were planes with a specified strike, dip and rake, upon which the stress changes caused by source faults were resolved (Toda et al. 2005, Lin and Stein, 2004). Calculations of Coulomb stress changes indicated that the second earthquake occurred when the Coulomb stress was increased by the first event. Hence, the second event of Ahar-Varzaghan double earthquakes appears to have been triggered by an increase in the static Coulomb stress transferred by the first event. This means that the positive stress changes caused by the first source fault have promoted the failure on the second fault. In order to examine the triggering relationship between the aftershocks and the main shocks, the stress field due to Ahar-Varzaghan double earthquakes were calculated along two kinds of receiver faults including a specified oriented receiver fault and an optimally oriented strike - slip receiver faults (OOPs). The optimal receiver fault orientation is deﬁned by the orientation of the principal axes of the regional stress ﬁeld. The analysis shows that there is a good correlation between the spatial distribution of the aftershocks and the stress increased in the regions along the specified orientation receiver fault. Therefore, the aftershocks took place in response to the coseismic stress caused by the occurrence of Ahar-Varzaghan double main shocks. Hence, the stress-enhanced regions on this type of receiver fault can be introduced as the most likely site of the next earthquakes. اسلامی، آ.، تقابنی، م. 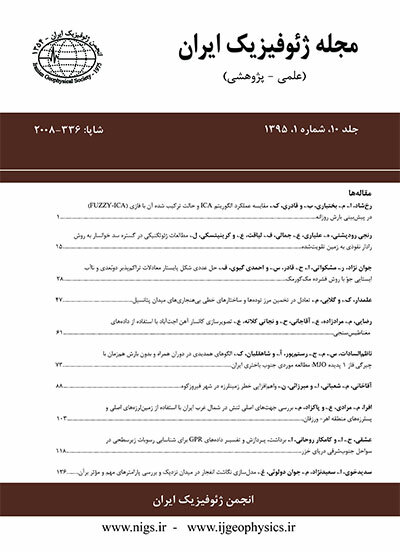 و اشعری، ع.، 1391، گزارش زمین‌لرزه­های 21/05/1391 اهر-ورزقان: پژوهشگاه بین‌المللی زلزله‌شناسی و مهندسی زلزله. راست‌‌بود، ا.، وثوقی، ب.، کاردر، ف. و کریمی دونا، ا.، 1389، مدل‌سازی زمین‌لرزه (20/12/2010) 6/5 =Mw منطقه جنوب خاوری محمدآباد ریگان: بیست و نهمین گردهمایی علوم زمین، سازمان زمین‌شناسی و اکتشافات معدنی ایران. زارع، م.، کلانتری، ا.، انصاری، ا.، حق‌‌شناس، ا.، داوودی، م. و مصطفی‌‌زاده، م.، 1391، گزارش شناسایی مقدماتی زمین­لرزه­های دوگانه ورزقان (شهرستان اهر- استان آذربایجان شرقی) 21-5-1391: ﭘﮋوهشگاه ﺑﯿﻦاﻟﻤﻠﻠﯽ زﻟﺰﻟﻪ ﺷﻨﺎﺳﯽ و مهندسی زﻟﺰﻟﻪ، 13ص. سازمان زمین­شناسی و اکتشافات معدنی کشور، 1391، گزارش مقدماتی زمین­لرزه 21 مرداد ورزقان – اهر. سیاهکالی مرادی، ع.، تاتار، م.، هاتسفلد، د. و پل، آ.، 1387، مطالعه ساختار سرعتی پوسته و سازوکار گسلش در زون گسلی امتدادلغز تبریز: علوم زمین، 70، 140-153. فخرائی، ز.، پورکرمانی، م. و مؤید، م.، 1388، زمین‌شناسی ساختمانی، لرزه­خیزی و لرزه­زمین‌ساخت سد خاکی ورزقان میانه: ﻓﺼﻠﻨﺎﻣﻪ ﻋﻠﻤﻲ ﭘﮋوﻫﺸﻲ زﻣﻴﻦ و ﻣﻨﺎﺑﻊ واﺣﺪ ﻻﻫﻴﺠﺎن، 1، 57-64. Berberian, M., and Yeats, R. S., 1999, Pattern of historical earthquake rupture in the Iranian Plateau: Bull. Seism. Soc. Am., 89, 120-139. Das, S., and Scholz, C. H., 1981, Off-faul aftershock clusters caused by shear stress increase: Bull. Seism. Soc. Am., 71, 1669-1675. Gardner, J. K., and Knopoff, L., 1974, Is the sequence of earthquakes in Southern California, with aftershocks removed, Poissonian: Bull. Seism. Soc. Am., 64, 1363-1367. Gheitanchi, M. R., Mirzai, N., and Bayramnajad, E., 2004, Pattern of seismicity in Northwest Iran, revealed from local seismic network: Geoscience, 11, 104-111. Hainzl, S., 2009, Earthquake triggering and interaction, University of Potsdam. Harris, R., 1998, Introduction to special section: stress triggers, stress shadows, and implication for seismic hazard, J.: Geophys. Res., 103, 24347–24358. Hessami, K., Pantosti, D., Tabassi, H., Shabanian, E., Abbassi, M. R., Feghhi, K., and Solaymani, S., 2003, Paleoearthquakes and slip rates of the North Tabriz Fault, NW Iran: preliminary results: Annals of Geophysics, 64, 903-915. IRSC, Iranian Seismological Center, http://irsc.ut.ac.ir. Jackson, J. A., Haines, A. J., and Holt, W. E., 1995, The accommodation of Arabia-Eurasia plate convergence in Iran: J. Geophys. Res., 100, 15205- 15209. Karkhanian, A., Trifonov, V., Philip, H., Avagyan, A., Hessami, K., Jamali, F., Bayraktutan, M. S., Bagdassarian, H., Arakelian, S., Davtyan, V., and Adilkhanyan, A., 2004, Active faulting and natural hazards in Armenia, eastern Turkey and Northern Iran: Tectonophysics, 380, 189-219. King, G. C. P., and Cocco, M., 2001, Fault interaction by elastic stress changes: New clues from earthquake sequences: Advanced Geophysics, 44, 1–38. King, G. C. P., Stein, R. S., and Lin, J., 1994, Static stress changes and triggering of earthquakes: Bull. Seism. Soc. Am., 84, 935-953. Lin, J., and Stein, R. S., 2004, Stress triggering in thrust and subduction earthquakes, and stress interaction between the southern San Andreas and nearby thrust and strike-slip faults: J. Geophys. Res., 109, B02303. Masson, F., Chery, J., Martinod, J., Hatzfeld, D., Vernant, P., Tavakoli, F., and Ghafori-Ashtiani, M., 2005, Seismic versus aseismic deformation in Iran inferred from earthquake and geodetic data: Geophys. J. Int., 160, 217-226. McClusky, S., Bassalanian, C., Barka, A., Demir, C., Ergintav, S., Georgiev, I., Gurkan, O., Hamburger, M., Hurst, K., Hans-Gert, H.-G.,. Karstens, K., Kekelidze, G., King, R., Kotzev, V., Lenk, O., Mahmoud, S., Mishin, A., Nadariya, M., Ouzounis, A., Paradissis, D., Peter, Y., Prilepin, M., Relinger, R., Sanli, I., Seeger, H., Tealeb, A., Toksaz, M. N. and Veis, G., 2000, Global Positioning system constraints on plate kinematics and dynamics in the eastern Mediterranean and Caucasus: J. Geophys. Res., 105 (B3), 5695-5719. Nalbant, S. S., Hubert, A., and King, G. C. P., 1998, Stress coupling between earthquakes in northwest turkey and the north Aegean sea: J. Geophys. Res., 103, 24469–24486. Nalbant, S. S., Steacy, S., and McCloskey, J., 2006, Stress transfer relations among the earthquakes that occurred in Kerman province, southern Iran since 1981: Geophys. J. Int., 1, 309-318. Okada, Y., 1992, Internal deformation due to shear and tensile faults in ahalf-space, Bull. Seism. Soc. Am., 82, 1018–1040. Rajput, S., Gahalaut, V. K., and Sahu, V. K., 2005, Coulomb stress changes and aftershocks of recent Indian earthquake: Current Science, 88 (4), 576-588. Reid, H. F., 1910, The mechanics of the earthquake, the California earthquake of April 18, 1906, Report of the State Investigation Commission, 2, Carnegie Institution of Wash ington, WashingtonD.C. Scholz, C. H., 1990, The Mechanics of Earthquakes and Faulting, CambridgeUniversity Press, New York. Stein, R. S., 1999, The role of stress transfer in earthquake occurrence: Nature, 402, 605–609. Stein, R. S., King, G. C. P., and Lin, J., 1992, Change in failure stress on the southern San Andreas fault system caused by the 1992 magnitude = 7.4 Landers earthquake: Science, 258, 1328-1332. Toda, S., and Stein, R. S., 2005, Richards-Dinger K., Bozkurt S. B., Forecasting the evolution of seismicity in southern California: Animations built on earthquake stress transfer: J. Geophy. Res., 110, 1-17. Wells, D. L., and Coppersmith, K. J., 1994, New empirical relationships among magnitude, rupture length, rupture width, rupture area, and surface displacement, Bull. Seism. Soc. Am., 84, 974–1002. Zamani, B., 2008, Study of Tectonic Stress State of Crust of Iran: Ph. D. thesis, Shiraz University, Iran.